Flowers bring double the pleasure if you cut them and bring them inside. That way, you get to enjoy them first outside in your garden and then inside your house. Their colors are lovely, it goes without saying. Then, depending on the flower, its fragrance may fill a room, making your life just that much better. Many flowers work equally well in a vase and in the garden – as long as you have planted enough so that you don’t strip the garden to make a bouquet. Tulips and daffodils, for two, look great inside and out. A big vase of lilacs is almost as striking as the bush in full bloom. Others are planted specifically to be cut – grown for no other reason than the pretty bouquets they make. Nancy Stedman of Little River Flower Farm in Buxton has grown cut flowers commercially for more than 20 years, both annuals and perennials. “I like plants that once you cut them, they come back again,” she said in a telephone interview. Examples of flowers that will produce more blooms after cutting include zinnias, dahlias, Shasta daisies, cosmos, ageratum, black-eyed Susan, delphiniums, snapdragons, celosia, Veronica, sweet William, sunflowers and – one of her favorite cut flowers of all – lisianthus. Lisianthus is tough to grow from seed if you don’t have a greenhouse, but often is sold as plugs (very small, young plants with independent root systems) or small seedlings. It produces full flowers on long stems, does so all summer long and has colorful rose-shaped blossoms that make it especially popular for weddings. 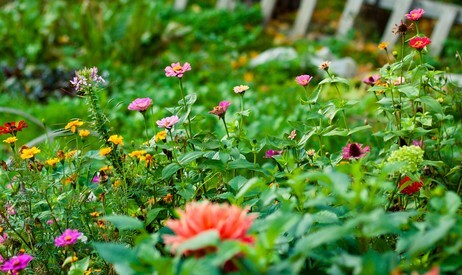 To grow good cut flowers you need full sun, plenty of water and rich soil with a lot of organic matter, Stedman advised. For a home gardener, that kind of watering can easily be done by hand. Straight stems are important, especially in the commercial trade. For that reason a lot of cut flowers need support, ranging from simple bamboo stakes to elaborate grids that can be raised as the flowers grow, similar to peony hoops, where a circular grid is supported by stakes. Flower arrangements usually contain more than blossoms, so Stedman sells many types of grasses and herbs, too. My wife Nancy and I have only a few plants that we grow primarily as cut flowers – dahlias, gladioli and occasionally cosmos and annual bachelor buttons. The rest are plants we grow because we like how they look in the garden; that they look pretty in vases, too, is a perk. I’ve already mentioned lilacs; we often cut viburnums, rhododendrons, roses, amelanchier, hydrangeas and magnolia, too. The blossoms of these shrubs need special treatment when brought inside. Cut as long a stem as possible, and then use hand pruners to cut a cross in the bottom of the stem to let it draw in more water. Also, be sure to place these stems, as well as any cut flowers, in lukewarm rather than cold water. If the flowers have wilted, you may be able to revive them: Take a deep bowl of warm water, the same temperature as a baby’s bath, and cut off the bottom of the stem while you hold the stem under water. Leave the recut stems in the water as it cools. In addition to daffodils and tulips, other perennials that look nice in a vase include both bearded and Siberian irises, phlox, lilies (if you have kept the lily-leaf beetle under control), perennial bachelor button (both in pink and in blue), lady’s mantle and peonies. Remember when cutting perennials that small flowers can work as well as big ones. A small vase full of violas or lily-of-the-valley looks elegant next to the bathroom or kitchen sink. Don’t restrict yourself to flowers. Grasses, hosta leaves and many other foliage plants look good in arrangements, either by themselves or as a complement to flower blossoms. In our house, Nancy does all the flower arranging, and most of the cutting. She is a flower show judge, having taken courses, passed tests and won floral design competitions certified by the National Garden Club, and I wouldn’t intrude on her domain. So next time you take a stroll around your garden before dinner, bring your hand pruners. Cut some flowers and foliage to put in a vase for the table. Few small things bring as much pleasure as beautiful flowers with good food. And when you are thinking of plants to put in your garden in the first place, consider how they will work as cut flowers. Almost anything is better if it has multiple uses.